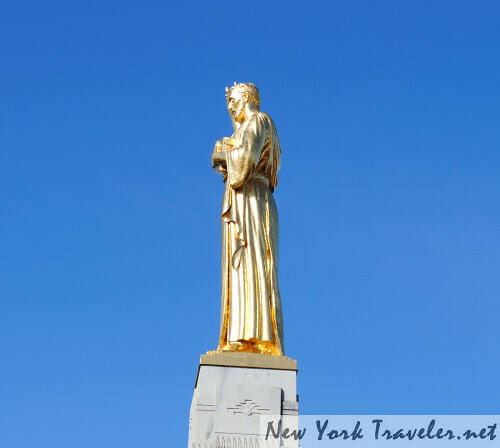 We traversed to the historic Hill Cumorah site after seeing the Joseph Smith historic site outside the town of Palmyra. 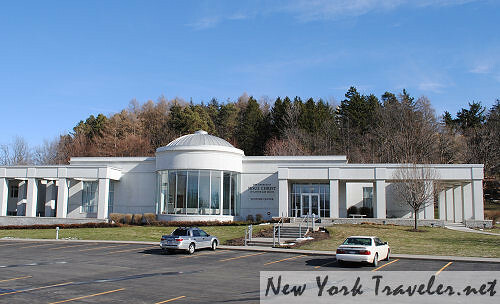 Even though there were a few cars parked outside the visitor’s center, the place was rather creepy. The wind was incredibly torrential that day, and the air biting cold. There was no human activity at all. Everything was stone cold and still except that monstrous wind! Still, we braved the fierce winds that nearly blew the camera out of my hands, and reached the summit. 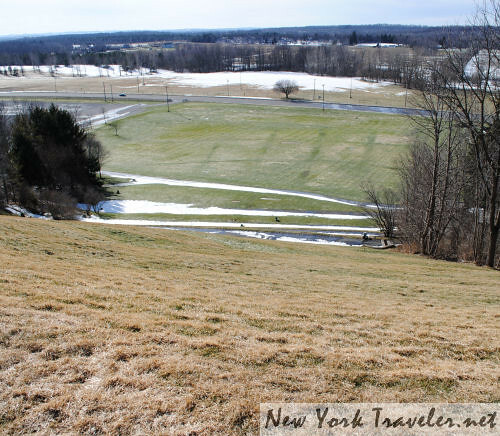 Hill Cumorah is a drumlin, a humpbacked whale-shaped little hill supposedly created by ancient glaciers. Some postulate that drumlins were formed by catastrophic flood waters releasing currents of water under great pressure by glacial ice. They are so notable because they seem to pop up out of nowhere, up from a flatter area of land. I had been here decades ago, as a young person, to see the historic Easter pageant held every year on the hill. I remember the experience well. We’d arrived early; my brothers and I ambled up the rocky walls and steep hill, exploring the site before twilight settled. As dusk approached, more visitors arrived and we returned to where the family was sitting on the lawn. As darkness fell, the colorful lights and bombastic music of the pageant began. It lasted several hours. This is the site where Joseph Smith claimed to have received the golden plates from the angel Moroni. 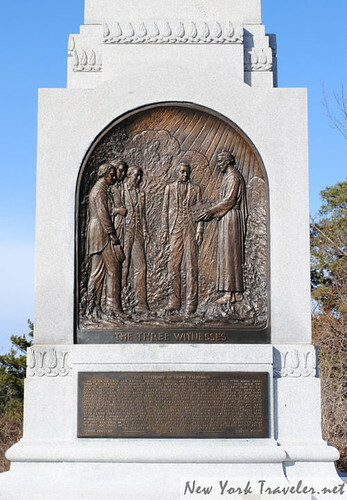 After Smith transcribed the plates into the Book of Mormon, Moroni instructed Smith to bury the plates. Later attempts were made to discover them… but NO ONE knows where the gold plates have gone….. 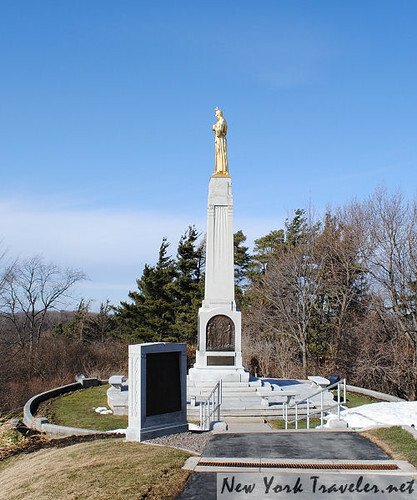 The top of the hill is like a park, with numerous monuments and engravings. Besides the unusually shiny Moroni on a pillar, there are plaques detailing the Joseph Smith accounts. I say “accounts” because after a few years, Mr. Smith was inconsistent with his stories. My daughter read a few excellent books about Mormonism a few weeks before we visited Palmyra, oddly enough. If you’d like a little insight into the Mormon story and biography and character of Joseph Smith, she recommends them: “Reasoning from the Scriptures” by Ron Rhodes; “The Mormon Mirage” by Latayne C Scott; “Out of Mormonism” by Judy Roberts. Can you see how violently the trees are bending? It was so windy I almost lost my camera! The incline is quite steep, but very invigorating. We walked across the summit, following the concrete pathway around the hill. My parents never decided to join the Mormon Church. My stepdad believed it to be somewhat ridiculous, riddled with errors and conflicting testimonies from Smith himself, and full of silly folk magic that plagued many of the paganistic settlers of the Upstate New York wilderness. 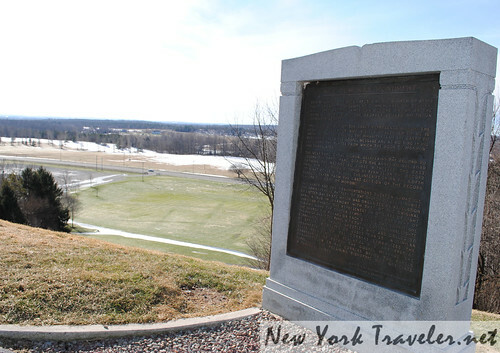 During the 1800s, New York and New England were a “hotbed” of mystical fervor, sprouting excitements such as the Oneida Community (another polygamous commune), the Cardiff Giant, Christian Science, and etc. I think many of the religious movements sprang up from a great dissatisfaction from the dead religions found in conventional Christian churches. It’s such a shame that the Christian churches has strayed so far away from Biblical doctrine that they had nothing to offer people anymore. After we wandered the site for a time, we decided to leave. I still can’t get over the ferocity of the wind!